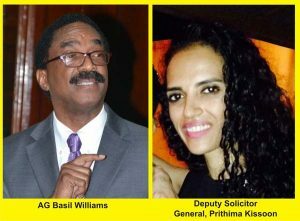 The complaint filed against Attorney General (AG) and Legal Affairs Minister, Basil Williams, by the Deputy Solicitor General (DSG), Prithima Kissoon, has been “rejected” by the Public Service Commission (PSC). The woman has been ordered to proceed on 72 days administrative leave. This was according to the Attorney General, yesterday, during a press conference hosted at his Chambers, Carmichael Street, Georgetown. Kissoon had filed the complaint days after the state-owned newspaper, Guyana Chronicle, carried a critical piece, insinuating that she was to be blamed for Government recently losing a race-baiting appeal case against former President, Bharrat Jagdeo. Kissoon in her undated letter to the PSC claimed that she was ordered to cease all cases on behalf of the AG Chambers and accused the Minister of verbal abuse, vilification and libel. The AG, on the other hand, accused Kissoon of “undermining” pertinent legal matters between the Government and the Opposition. The leave, Williams said, is to facilitate what he described as “investigations” into cases she handled particularly, those that involve Anil Nandlall and the Opposition. “I have asked the Permanent Secretary (PS) of the Public Service Ministry, to find out what is the proper procedure to be followed because she (Kissoon) falls under the Public Service. I have been informed that Ms. Kissoon has received communications from the PSC. “The communication rejected the application by Ms. Kissoon…She has been written to requesting that she leaves on administrative leave pending the investigation of all the cases she has done, especially those involving Mr. Nandlall and those involving the former government,” the AG said yesterday. Meanwhile, as it relates to the appointment of a Solicitor General (SG), Williams said there are several applications which are currently being examined by the relevant persons. He said however, that the administration will have no choice but to “bite the bullet” and appoint “senior people” who are equipped with the requisite experience. These “senior people”, Williams said, may attract a higher cost since the younger lawyers are not too “experienced”. Meanwhile, Williams was quizzed about the alleged “shifting” of powers in the judiciary by the former regime. He had stated previously that under the People’s Progressive Party/Civic (PPP/C), the powers were removed from the Chief Justice’s office to the Office of the Chancellor. Plans are afoot to address this issue, Williams told Kaieteur News.